The best pitching coaches in softball are tied together by more than their success. Discover the final 2 things that make the best, the best. The gap between good and great is time. Excellence over time is what the best have in common, and when it comes to pitching, they all do these 5 things. The last two things involve a pitcher’s mental game, which is where a pitcher’s success lives and dies. While a pitcher might be extremely gifted with speed or movement – and on the rare occasion, both – that pitcher never becomes outstanding without having a strong mental game to help her successfully handle the rigors of championship play. As the college softball season heads into conference play, pitchers are starting to struggle. Facing a lineup of 9 college hitters can seem daunting and having the ability to stay calm mentally when things start falling apart is no easy feat. Telling a pitcher to calm down is different than the pitcher actually calming down. One is advice and the other is action. Every coach wants their words to be turned into action instead of merely heard as advice. Deeply Challenge – The best are not afraid to deeply challenge their pitchers. This deeper type of challenge happens daily in practice through the use of competitive games, through the daily tracking of strike percentages and in the form of individualized comments like “I know you can be braver – you’ve got more in you than that”. Competitive games like the 1 Pitch Scrimmage to the right deeply challenge your pitchers to get ahead in the count early. 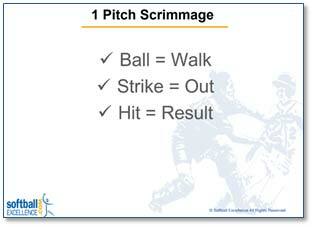 Your pitcher will throw 1 pitch to each hitter; if the pitch is a ball, the batter walks. If the pitch is a strike, the batter’s out, if it’s fouled off the hitter gets another swing, and if the ball is hit, you play it out. Switch pitchers after 3 outs. Keep track of each pitcher’s bases allowed and subtract a base for each out. The pitcher with the fewest bases allowed wins! Calmly Believe – Confidence is the golden ticket for pitchers, knowing that you can do something keeps you internally calm, allows you to be aggressive with your skill by attacking hitters instead of avoiding walks, and keeps everyone around you calm as well. Coaches are the confidence conduit. We convey our level of belief in our pitchers every time we talk to them in terms of what they can do, how we remind them what they have done, or simply in our body language. I’m reminded of one of my favorite quotes, by Boston College pitching coach Megan Brown – “All we need is the best you can bring today, we’ll find a way to win with that!”. This is one of the greatest things I’ve ever heard said to pitchers – it totally calms the pitcher down by letting her know that whatever she has today will help us win, while giving her incredible confidence in her and in you. By simply using the word “can” instead of “must” we change fear to belief. When the pitcher feels she “must” do something she gets tense and afraid. So instead of reminding herself that she “can do it”, she tenses up and tells herself that she “must”. The best pitching coaches in the game calmly and constantly transmit a very deep belief to their pitchers while managing to themselves remain calm under pressure. And the best part is, those are skills that don’t require natural talent, but simply the power to keep believing no matter what! Pitching Summit Vault: If you’re serious about helping your pitchers then you’ll want to check out our brand-new Pitching Summit Vault membership. Available either monthly or annually, the Pitching Summit Vault is our most recent Pitching Summit captured on video, in its entirety! That means over 7 hours of video of the best pitching coaches in softball talking about everything from workouts, to charts, to pitches, to ways to help your freshmen. Want to know what the Pitching Summit Vault is all about – check it out…Pitching Summit Highlight Reel! Save your spot in our 2018 Pitching Summit and Hitting Summit – sign up today!